Prepare yourselves Australia, because indie-pop hit-makers Grouplove will be hitting stages and thrilling audiences across the country in 2018! Much-loved visitors to our shores, the Californian band will be playing what are sure to be three wild nights in Brisbane, Melbourne and Sydney in February. Currently touring across America, Grouplove will be bringing their energetic live show and infectious tunes to Australia for the first time in more than 18 months. Be sure to get your dancing shoes on, because they’ll be sure to have their new single Remember That Night in tow, along with a setlist chock full of fan favourites from all of their three albums. Fronted by the husband-and-wife team of Hannah Hooper (vocals, keyboards) and Christian Zucconi (vocals, guitar), Grouplove also includes Andrew Wessen (guitar, vocals), Ryan Rabin (drums), and Daniel Gleason (bass). The five-piece are renowned for their relentlessly positive live performances, bringing an energy and pure joy to the stage that is rarely seen in modern music. Formed in 2009 after the band members met at an arts colony on the Greek Island of Crete, Grouplove have been a household name ever since the release of their debut album Never Trust a Happy Song. Party anthems such as Tongue Tied and Itching on a Photograph quickly cemented the band as a staple of festivals, sold-out shows and indie radio around the world. The group’s follow-up album Spreading Rumours produced the hits Ways to Go and Shark Attack, while their most recent full-length effort - 2016’s critically acclaimed Big Mess gave the world catchy sing-alongs Welcome to Your Life and Good Morning. Big Mess was produced by the band’s own Ryan Rabin and Phil Ek (Fleet Foxes, Band Of Horses, The Shins) and reached the top 20 of the Australian charts after its September 2016 release. Grouplove have been far from quiet since then, with the release of the Little Mess EP and new single Remember That Night this year. You might also recognise their distinctive style as the creators of the closing credits theme song on the Netflix Original Series Bojack Horseman. "We've been writing a lot of new music recently – Hannah in particular is starting to come into her own in a new and very honest way. She is really starting to show her fire. Hope you can feel it,” said Grouplove’s Christian Zucconi about the new single. 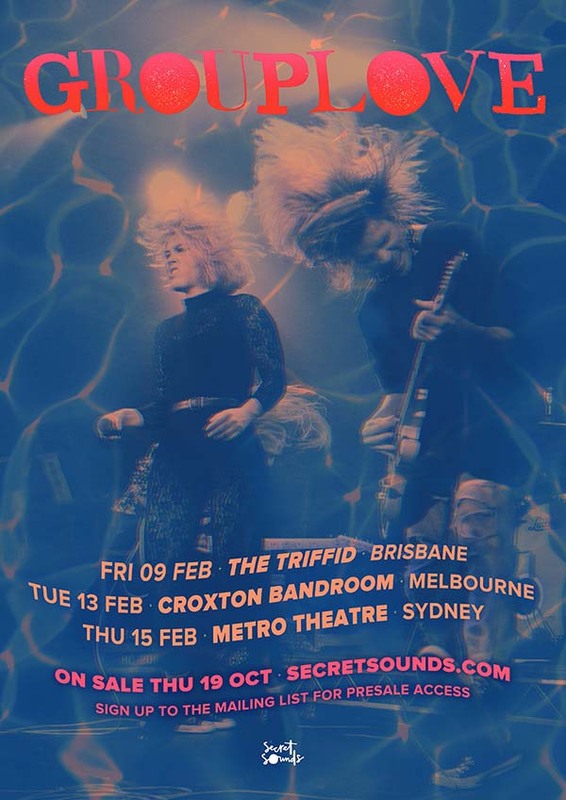 In addition to headlining efforts at NSW’s Mountain Sounds festival and Tasmania’s Party in the Paddock, Grouplove will be in Australia for three exciting dates.